Dr. Vamvakias is a 1994 graduate from NCSU-College of Veterinary Medicine. She has a diversified veterinary career with experience in the active, reserve, and civilian services of the US Army Veterinary Corps and the US Special Operations Command. She has extensive experience and training in small animal medicine, working dog medicine, and emergency medicine. Dr. Vamvakias is certified in Canine Rehabilitation Therapy, Veterinary Medical Acupuncture and Animal Chiropractic. She enjoys offering new approaches to pain management and improving the quality of life to her patients. Jessica was born and raised in North Carolina and has been working in the veterinary medical field for 18 years. She began her career as a Kennel Technician, and has held multiple positions in veterinary practices throughout her career. Jessica is currently our Practice Manager responsible for leading our awesome veterinary team. Jessica's special interests include digital dental radiology and advanced techniques and ultrasounography. She shares her home with her husband and her two daughters. In her spare time, Jessica enjoys spending time with family and friends, reading, running, and anything else that has her spending time outside. Amber is a Registered Veterinary Technician who grew up locally in North Carolina. 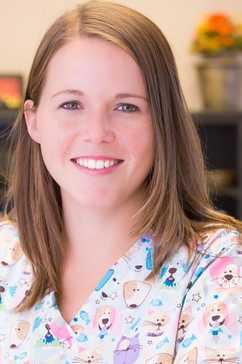 She has been working in a veterinary practice for over 6 years starting her career at UNC in Lab Animal Medicine before moving to private practice in Small Animal Medicine. She has always had a deep passion for animals and takes pride in her work. Her special interests are in Dentistry and Rehabilitation. Outside of work she loves reading, spending time in-or-near water, and making memories with her family. She shares her home with her husband and children, along with several 4 legged babies. Paige was born and raised in Moore County, North Carolina. She graduated from Central Carolina Community College's Veterinary Medical Technology Program in 2017. Paige has always had a connection with animals and she has known that she wanted to work with them since she was very young. She enjoys veterinary medicine and she has special interests in Rehabilitation and Ultrasonography. When not working, Paige spends her time with family and friends. She enjoys being outdoors and some of her favorite pastimes are fishing and taking long walks with her four legged family member. ​Emily is a native of Pinehurst. As a lover of the outdoors, she went to college in the mountains where she could regularly go skiing, hiking, and rock climbing. She graduated with a B.S. in Biology from Lees-McRae College in Banner Elk in 2007. Wanting a career working with animals, she went back to school and got her A.S. in Veterinary Technology from Central Carolina Community College in 2010. She has been working in small animal medicine ever since. When Emily is not working, you may find her running, reading, fishing, or simply enjoying the outdoors with her dog, Elroy. Lauren was born and raised in Moore County, North Carolina. From a young age, animals have always been drawn to Lauren enabling her to form special bonds with them. When Lauren was 12, she began volunteering at Moore Humane Society and continued there until she was 14. It was then she began to rescue and foster dogs until they could find their forever home. While Lauren has continued rescuing throughout the years, her real passion is senior dogs that need special care. In her spare time she enjoys spending time with her furbabies and fiance as well as hiking.